The online version of this article (doi:10.​1186/​1475-2867-12-19) contains supplementary material, which is available to authorized users. KB designed and acquired all of the cell-based assays, MH and FZ produced and collected the nuclear magnetic resonance experiments. CH, JD, and RAS helped design and acquire the ERK1/2 phosphorylation experiments and provided expertise in culturing monocytic cell lines. JD and JR helped produce stable knockdown cell lines. MC and CW provided expertise in culturing pancreatic cancer cell lines. EZE helped design all of the experiments. All authors read and approved the final manuscript. Although the peptidyl-prolyl isomerase, cyclophilin-A (peptidyl-prolyl isomerase, PPIA), has been studied for decades in the context of its intracellular functions, its extracellular roles as a major contributor to both inflammation and multiple cancers have more recently emerged. 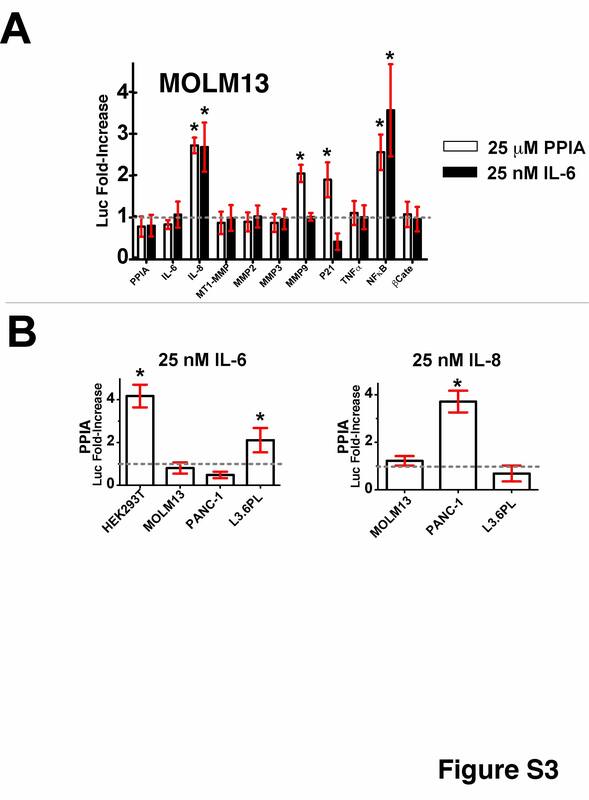 A wide range of activities have been ascribed to extracellular PPIA that include induction of cytokine and matrix metalloproteinase (MMP) secretion, which potentially underlie its roles in inflammation and tumorigenesis. However, there have been conflicting reports as to which particular signaling events are under extracellular PPIA regulation, which may be due to either cell-dependent responses and/or the use of commercial preparations recently shown to be highly impure. We have produced and validated the purity of recombinant PPIA in order to subject it to a comparative analysis between different cell types. 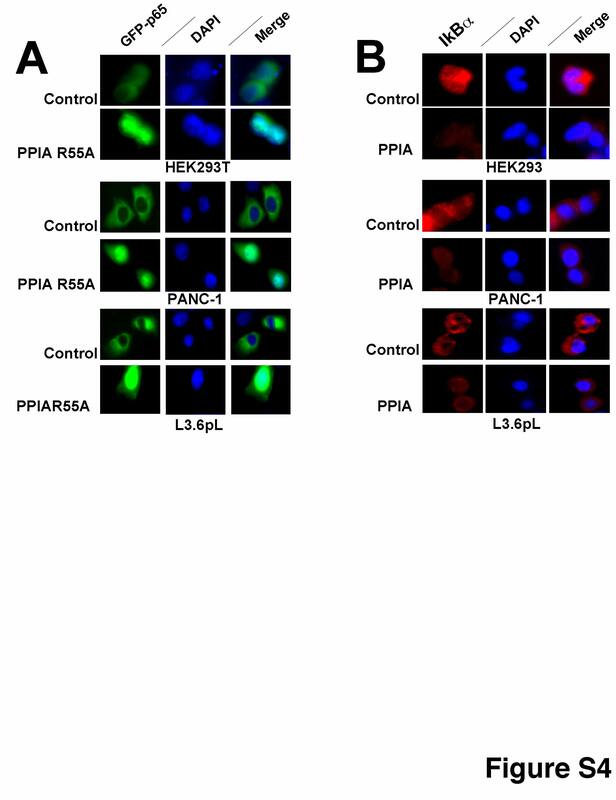 Specifically, we have used a combination of multiple methods such as luciferase reporter screens, translocation assays, phosphorylation assays, and nuclear magnetic resonance to compare extracellular PPIA activities in several different cell lines that included epithelial and monocytic cells. Our findings have revealed that extracellular PPIA activity is cell type-dependent and that PPIA signals via multiple cellular receptors beyond the single transmembrane receptor previously identified, Extracellular Matrix MetalloPRoteinase Inducer (EMMPRIN). Finally, while our studies provide important insight into the cell-specific responses, they also indicate that there are consistent responses such as nuclear factor kappa B (NFκB) signaling induced in all cell lines tested. We conclude that although extracellular PPIA activates several common pathways, it also targets different receptors in different cell types, resulting in a complex, integrated signaling network that is cell type-specific. Kim JY, Kim H, Suk K, Less WH: Activation of CD147 with Cyclophilin A Induces the Expression of IFITM1 through ERK and PI3K in THP-1 cells. Mediators of Inflammation. 2010, 10.1155/2010/821940. Seizer P, Schonberger T, Schott M, Lang M, Langer HF, Bigalke B, Kramer BF, Borst O, Daub K, Heidenreich O: EMMPRIN and its ligand cyclophilin A regulate MT1-MMP, MMP-9 and M-CSF during foam cell formation. Atheroslerosis. 2009, 201 (1): 51-57. Trachtenberg A, Pushkarsky T, Heine S, Constant S, Brichacek B, Bukrinsky M: The level of CD147 expression correlates with cyclophilin-induced signalling and chemotaxis. BMC Res Notes. 2011, 4 (396): 1-6. Umanah G, Huang LY, Schultz PG, Naider F, Becker JM: Incorporation of the unnatural amino acid p-benzoyl-L-phenylalanine (Bpa) into a G protein-coupled receptor in its native context. Biopolymers. 2007, 88 (4): 522-522.